Have you spotted any snails with anticlockwise shells? Once the weather starts to warm up, you could help some ongoing research by going on a hunt for unusual ‘lefty’ garden snails! In other words these are snails with shells that spiral anticlockwise, rather than the usual clockwise (spiralling to the right). Last November, a lefty common garden snail (Cornu aspersum), dubbed Jeremy (pictured on the right above next to a typical snail), was found on a compost heap in London. Jeremy was the only known example of a ‘sinistral’ common garden snail, with an anticlockwise shell. ‘Dextral’ snails are the norm with their shells spiral clockwise. Sadly for Jeremy, it is also very difficult for him to mate as his reproductive organs are also on the opposite side. 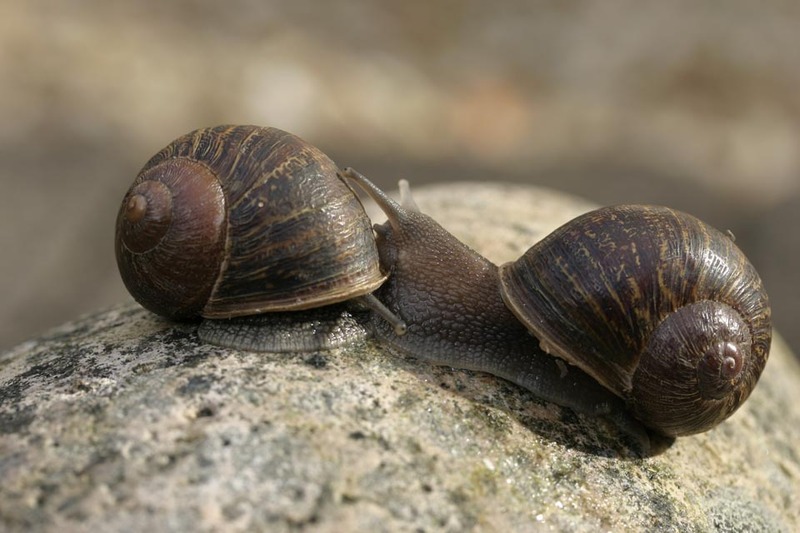 Snail expert Angus Davison, of the University of Nottingham, wants to discover whether Jeremy’s interesting characteristic is down to a glitch in his development or whether it is an inherited mutation. To help his research, he is asking gardeners everywhere to keep an eye out for other ‘lefty’ snails in hedgerows and gardens. This could be a fun activity for you and your pupils to carry out in the garden and learn a bit more about snails - you could even ask pupils to draw a snail that they find and colour in the shell with different colours and patterns. If you do happen to come across a garden snail with an anticlockwise shell, please email pictures and details to angus.davison@nottingham.ac.uk. And while you’re out searching for 'lefty' snails, why not take part in our Slug It! Slug Mapping Activity and make note of the slimy slugs you find around the garden? This is also part of some wider research being carried out by us and the Institute for Research in Schools.